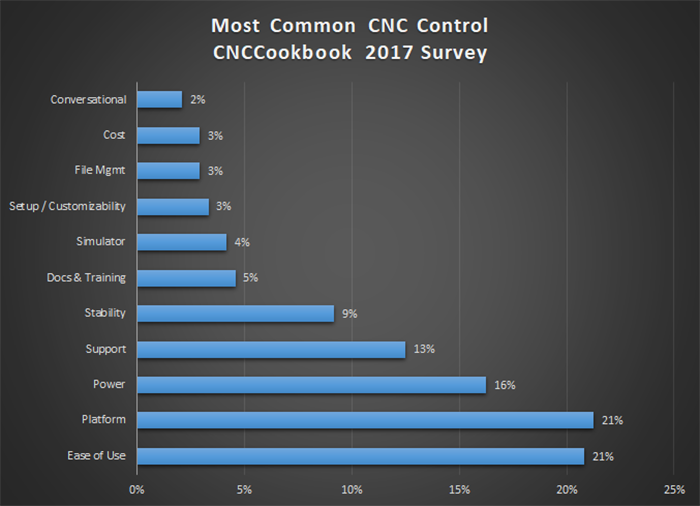 This is our second installment of results on our annual survey on CNC Controls, 2017 edition. 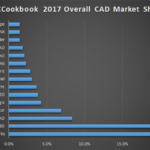 In the first installment, we went over the relative market shares of CNC Controls. 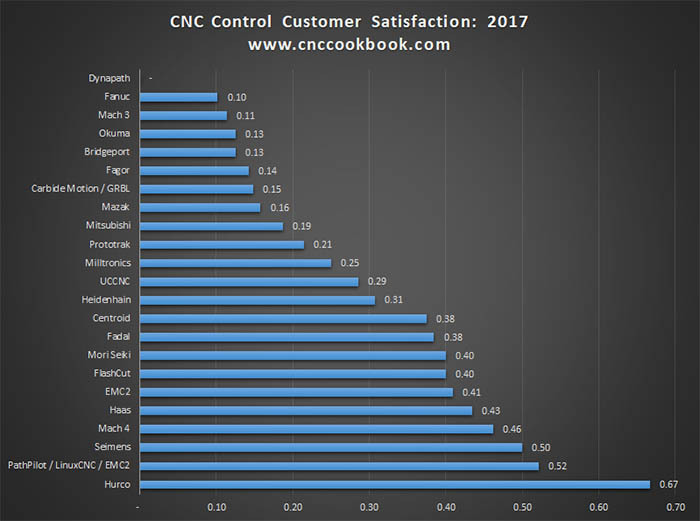 Without further ado, let’s check out the Customer Satisfaction scores for CNC Controls in 2017. At the top of the scoring were Hurco and PathPilot / LinuxCNC. In recognition of this, we’re awarding them Customer Satisfaction Seals. Congratulations on building such a well-liked control! 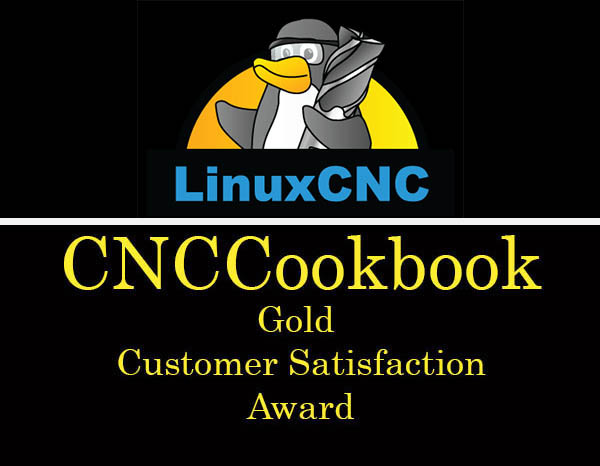 In the Hobby category, PathPilot / LinuxCNC took the top honors for Customer Satisfaction. I’ve used PathPilot quite a lot and find it super easy to use. In fact, I often miss it when I’m running a Fanuc control. It just seems so much easier and more intuitive with a full GUI behind it. There are still some things missing that the Pro controls can do, but PathPilot / LinuxCNC has come a long way. We’re giving a Gold award to each, as they’re based on the same core underlying code, but PathPilot has a different and richer User Interface on top of that core. When we do the CNC Control survey in 2018, I will break these two apart so they can be ranked separately. 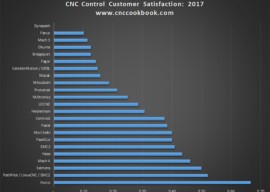 What is Most Important to Users in their CNC Controls? 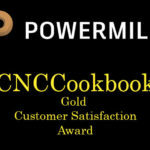 Suppose you were responsible for designing and implementing a CNC Control. What areas would you focus on to ensure the best possible Customer Satisfaction? 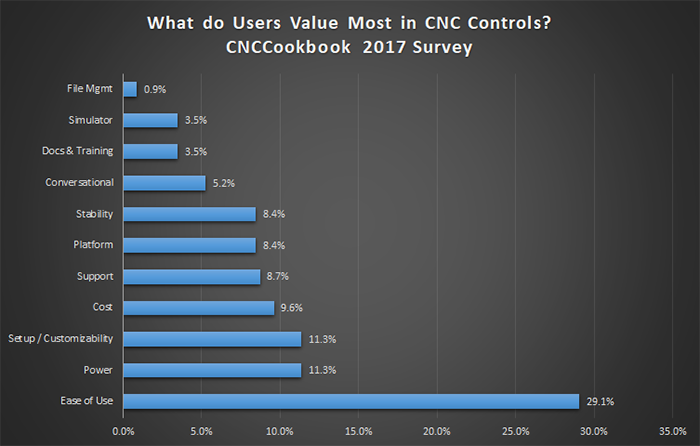 What do users value most in CNC Controls? The runaway best-selling area to focus on is Ease of Use. Not a big surprise. Having used a lot of different controls, I can tell you that many are not all that easy to use. Power and Setup / Customizability are tied for second place. Support: Can I get the help I need? This help can come from either the vendor or large online communities. It’s also a function of whether the control is kept current, or orphaned. Platform: What about the hardware under the software that is the control? Is it open? Is it proprietary, making it expensive and hard to work on? Stability: Stability was mentioned extremely often in the survey. A CNC Control is no place for buggy software. Docs & Training: Somewhat related to support–can I get what I need to help myself become proficient with this control? If we add all of these elements together, they have a combined score of 29.1%. That’s tied exactly with ease of use! When shopping for a control, be sure to look at these intangibles just as much as the sexier features, bells, and whistles associated with a control. 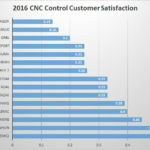 What do Users Dislike Most about their CNC Controls? The flip side of positives are the negatives. If you’re a CNC Control designer, what do you most want to avoid in order to keep your users happy? The number one areas for complaint were Ease of Use and Platform. Buttons on panel wear out too quickly or are too hard to press. Control is based on Windows. You get the idea what folks have problems with. And yes, its obvious some of these things are all about legacy controls. Some are also opinions not well supported by facts. In the Hobby World, its common to think a control running on Windows must be inferior to one running on LinuxCNC, but there are no end of Pro controls that run great with Windows. 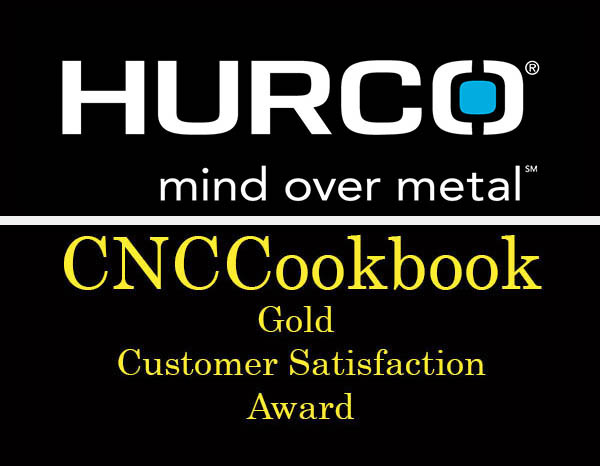 As a matter of fact, our Customer Satisfaction Gold Winner, Hurco, runs on Windows. A lot of problems with control software or lack of additional hardware motion control can lead to problems that seem Windows-related, but clearly they’re not. Inadequate work offsets or other features needed to control the coordinate system. Inability to do web monitoring of the control. Machine monitoring is one of the big deals our Top Shops survey analysis touched on. Lack of features related to Tool Data Management is another common complaint. Missing features that make shop floor programming easier. I’m used to Conversational CNC for this, but there are other features that go into this category. Non-standard g-code. I’ve said it before, but the world would be a better place if every CNC Control could execute Fanuc’s dialect plus added features on top of that. It’s not that hard to do, but doesn’t even occur to many Control Designers that it’s a good idea. A decent simulator with good backplot is expected in every control by this time. On-machine help and docs are also expected. That covers a lot of the areas to avoid if you want users to be happy with your CNC Control. Future Vision: What Does the Ultimate Control Look Like? I want to indulge for a minute in visualizing what the Ultimate CNC Control might look like. As a product designer and holder of a number of patents, many oriented towards ease of use, I’ve got some demonstrated talent for this. As a CNC’er, I’ve also got some strong opinions about what I wish controls would do differently. There’s no excuse in this day and age for the dated look so many CNC Controls have. We’ve learned how to do this far better. It’s time for the proprietary OS crowd to start building on top of more reasonable operating systems. Either Windows or Linux have been demonstrated to work great. There are excellent graphical user experiences demonstrated on either. Don’t forget a great Simulator and Backplot while you’re at it. It’s table stakes any more on a CNC Control. Come on proprietary hardware sellers. Quit charging us a fortune for memory and Ethernet access. Quit making us pay dearly when we need to replace a screen or some other component. CAM posts are a dime a dozen. No more pulling your hair out to get a post for some obscure control. All the books, online courses, and training out there for Fanuc are now applicable to your control too. You still get to innovate and give your customers advantages over others. Haas has done a masterful job of this. Haas controls execute vanilla Fanuc just fine, but add all sorts of wonderful extensions. A world of other software such as g-code simulators that work fine with Fanuc gcode now work for your users too. Plus, you made it so much easier for those vendors to support your additional features to give themselves an advantage with your community. I groan every time I run into a g-code dialect that’s radically different from Fanuc and have to make it work on my G-Wizard Editor and GCode Simulator. Add really good Conversational CNC. 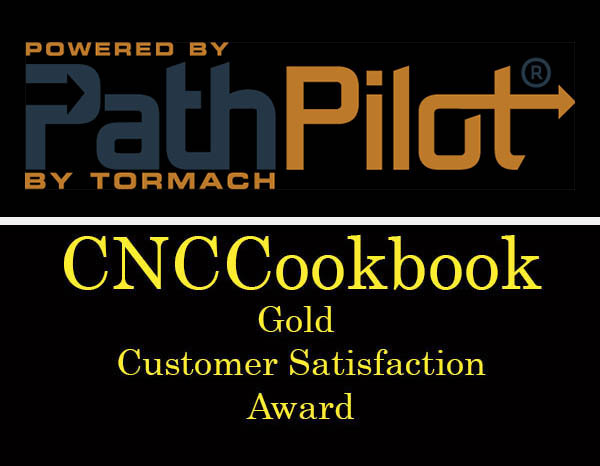 Folks, I don’t think it’s a coincidence that two of our Gold Customer Satisfaction winners, Hurco and PathPilot, are known for great Conversational CNC. Things happen on the Shop Floor. The round trip to make a change by updating or creating a CAD model, running it through CAM, and then coming all the way back to putting g-code on the machine is a long one. It’s fine for complex parts, but why am I running around that track when I just want to put a few holes in a rectangular bracket? Every CNC Control should have great Conversational CNC! For those that don’t (and may never), we offer G-Wizard Editor with builtin Conversational CNC Wizards. Machines should have tool sensors and the smarts to keep the Tool Table always correct. It should be impossible to insert a tool into the spindle or changer without all that information being set completely automatically. The only exception should be in a production environment where Tool Room Tool Presetting is in use to keep the machine spindles turning. Even then, tool sensors are needed to monitor tool wear and breakage. Plus, the control should be smart enough to communicate with the presetter and to read the toolholder to match it up with information coming out of the Tool Room. Perhaps an RFID tag on each toolholder or a laser scanner that reads a barcode when you insert the holder in the spindle would solve the problem. Wouldn’t that be seriously slick? There aren’t enough skilled machinists out there. Automating setup will help the skilled people we have go further and make the unskilled labor more successful. The controls we have today are fine for well-trained operators and machinists. But I am seeing more and more activity in the prototyping market. Companies are discovering that equipping their engineering and design teams with CNC machines so they can quickly iterate a real design and hold the product in their hands is extremely beneficial. Smaller batch sizes associated with Just In Time inventory mean shops do more setup. Integrated Tool Data Management: check! Digital camera assisted setup: this is the kind of next gen integrated setup we need! 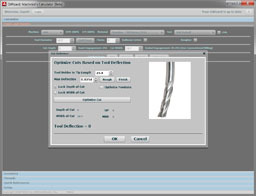 Extensive integration with 3D probe. Check the setup operation where the operator swipes the image of the workpiece to indicate which corner to probe. The probe then ensures that corner is located accurately and used for part zero. This can be done on today’s industrial controls, but it’s incredibly clunky. Jog to a location instead of the quick digital camera to get to a vicinity. Then, have you seen how most probes are accessed via MDI these days? You have to know which subprogram to call. Yuck! Datron has had this feature for quite a while. When programming, you can switch between gcode and a higher level language to customize the machine for specific operations. Need to present a friendly menu to the operator about how to set up a fixture? No worries, it’s easy to create on the Datron, and it should be easy to do with any other control too. Especially with an integrated digital camera. Let’s get beyond basic Setup management and manage all our modular fixtures this way. While we’re at it, can we move away from T-Slots and just make the machine’s table be a modular fixture plate? It should be quick and easy to program the machine to know about any fixture via a touch screen interface similar to what Datron shows in their videos. All of this should be expressible as Fanuc-standard G-code that can be put on a USB key or drip fed to a machine when a particular setup is called for. In fact, let’s program via touch swipes and digital camera, then push a button to download the g-code that can be used to similarly configure any machine. Put all that into a library and we’ll be cooking with fire in no time. What’s on your wish list for the ultimate CNC Control? Tell us in the comments below! 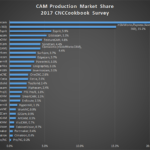 Best overview of reasonable CNC options on the internet today. Attaboy!! !